I have one of the Stauer older Atomic watch and I love it. This new one would make anyone a great gift. The only problem I have with mine is, that when I get next to my computer, the watch loses time and has to be reset. This may have just been my watches problem and not these new ones. Does anyone else have this problem and do you know if these new ones has this problem. Thank you Gary. I have just received my Stauer Titanium Atomic Watch. I have enjoyed its looks and operation. I have been able to adjust the watch and the time is fantastic. I received mine as a Christmas present. On Christmas Day it really took some time to set it up and change the time zone. Finally I was able to figure it out and it is now running great. I did wonder however if there is a watch battery or if the watch just will continue to run via the atomic clock.Thanks for a great watch. Keeps great time and is easy to read. It is extremely light on the wrist which is a big plus. Perhaps because atomic watches represent the ultimate in Function they have tended to be somewhat deficient in Form. Most of them look like ordinary watches or, worse, CHEAP ordinary watches. It speaks volumes that one of the earliest atomic watches, the Junghans/Wittnauer, is STILL one of the most beautiful. Well, with their Titanium Atomic Watch Stauer is deviating from this pattern.This is simply one of the best looking atomic watches ever made! No one will mistake it for some bargain basement cheapo; on the other hand no one will guess that you paid less than $200 either! In comparison with my old Junghans/Wittnauer it advanced second by second in lockstep, its large hand ticking off each minute in three, twenty-second steps.Criticisms? Well, in contrast with my old Junghans/Wittnauer I miss having the date and the seconds shown AT THE SAME TIME in the display. More significantly I miss having the current time zone shown in the same display. Still, these are minor points. In short I think I might have FINALLY found a replacement for my old Junghans/Wittnauer; at least the Stauer doesn’t need an external antenna in the watch band! The watch is everything it says it is, and works great. Looks fantastic. I just received my Titanium Atomic Watch yesterday and I couldn''t be more satisfied. The craftsmanship and quality of the watch is impeccable. I think it compares more than favorably to watches costing hundreds of dollars more. I expect that I will wear this watch proudly for many years to come. Oh! by the way, the time setting is perfect. Thank for making a great timepiece! My Titanium Atomic watch exceeds all hopes/expectations. Many of us experience an inner satisfaction knowing that we can always know the exact time, at any time. This is the watch for us! Moreover, the watch is so lightweight that I am hardly aware that I am wearing it. The face and dials are easy to read. The accompaning brushed metal band adds it own elegance to the finished watch. 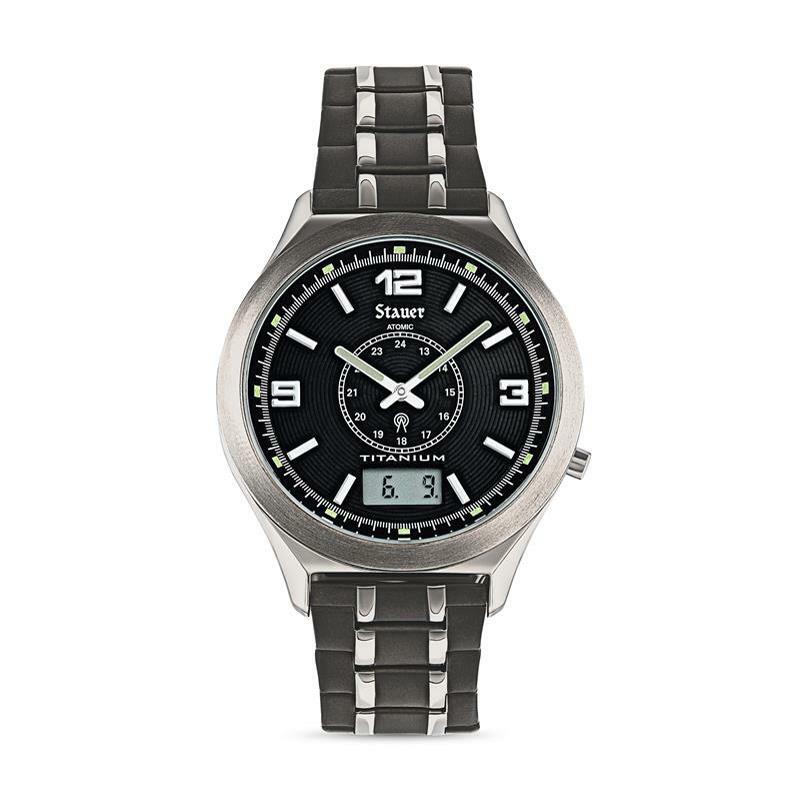 Kudos to Stauer for offering this excellent timepiece. This is a great watch. It is not my first atomic watch but it is the nicest. This watch is everything the ad says about it. Well Done. If I were designing this watch I would have done one thing differently, I would have included a sweep second hand, but that does not detract from how much I like it. I got this watch as a birthday gift to be used at work. My job can be rough sometimes and I needed a watch to handle this. I found it. Great watch. Lite wieght and rugged. Reccomended for the working man. I have had mine for about a year and love it. I read the directions to set the time when it first arrived. Months later I traveled across the country and left the instructions at home. Having done it once, I was able to remember the basics and reset the watch for the new time zone. It is comfortable, durable and stylish. I had noted this watch in the ads and mentioned it in passing to my daughter, who got the hint. I received it on Christmas day and haven''t been without it since. For a long time, I avoided wearing watches because of problems with a sensation of weight on my arm, and the hassles of resetting, etc. This watch solves all that. Once the band was properly fitted, it is almost imperceptible. It''s a treat to always have the exactly correct time. It simply looks beautiful and elegant. I am completely satisfied and happy with this wonderful watch. Man this a cool watch. I just put it on ...it was all set. if your on the fence you got to get one!! I received my watch today and unpacked it right awayto find a beautiful looking timepiece. It had already been set to Standard Time and had the correct time with the seconds in the display just ticking away. All I had to do was hit the B button once and the month and day of the month appeared. That is where it will remain until day light saving time changes again. I like the band as well. Thanks Stauer for making this timepiece available for such a good price. Hey this is a cool watch!! no more pulling out the cell phone to check the time.I''m a carpenter and wear it all day and going uot at night. no problem clraning with an old tooth brush and it looks new!! I've had it since feb. just a tough good looking watch that keeps incrediible time. I received my Atomic watch last month. It is truly a Beauty and most accurate. This watch is the fourth in my collection of Atomic watches. The only set up was the time zone. Called the Naval Observatory in Washington, D.C. to verify the accuracy. Couldn''t even detect a second off the Observatory Clock. This watch is the only analog watch in my collection. I enjoy watching the advancing minute hand every 20 seconds and seeing the digital seconds advance alongside the Tower symbol indicating the Radio Reception is on. The Luminous hands and markers are a neat touch to a fabulous watch. Received my watch in May and was impressed with it''s looks and timekeeping. The instructions to set the time zone were easy to follow. A tool to set the watch is included and easy to use. A call to the Naval Observatory indicated the watch did not gain or loose a second in almost two months. The luminous hands and hour markers are also an nice touch for telling the time in the dark. My wife surprised me yesterday with this watch as a gift and I am extraordinarily pleased with the item. It is light on the wrist but clearly well manufactured, it doesn't look or feel cheap at all. Several coworkers complimented me on it today. I would highly recommend this item to anyone. as a military offier, I depend on my watch, however, the government doesn''t really keep up with technology, and we are issued old equipment first and my watch looks real cheap and usually has to be repaired frequently,I am defintely ordering this watch and wait for the hassle of el cheapo military issue to be relaced with my new atomic watch so, when I go to the battlefeild,I know it will work through sand and muck or gunfire and maybe save my life. My Biggest problem was with setting the watch whem received 9/10. AZ is not on daylight time so it was very hard to set. I had a watchmaker working for several days but we managed to overcome. AZ is the last state in the union to not go daylight so the problem is only located here. Like many of you I''ve enjoyed my share of fine watches (read:EXPENSIVE)........ and kept looking at this one regularly. After a year I finally decided to try a Stauer Watch --- really happy with it. I''ve had it a couple of months and it has kept TRULY perfect time --- as it is described. Only negative is the band does not appear to be titanium and there were no instructions included to shorten the band for my wrists, but the internet found numerous helpful sites. Good purchase!! this atomic watch is the fifth stauer watch i''ve ordered. i am more then pleased with each and every one of them. the atomic watch will remain my favorite stauer. it is everything it claims to be and more. i would definitely recommend it to anyone. I received my atomic watch a couple of days ago and all I can say is wow...what quality, looks and value for your money. I don''t know how stauer does it but they do. This is my 4th watch that I purchased and am totally satisfied with every one. The atomic watch is light easy to set and trouble free. Thank you stauer for a great product. I will be back to purchase more in the near future. I just received this watch a few days ago as a 50th birthday gift from my wife. Even though I picked it out for her to buy, I have to say that it looks even better in hand than in the website photos.This is a beautiful watch, and I hope to wear it a long time. The face is stylish yet easy to read, especially important for middle-aged (and older) eyes. The stem also answers one of my main gripes in that it doesn''t stick out at the 3 o''clock position, but is positioned slightly lower where it doesn''t dig into my hand (I''ve had other watches that I had to stop wearing because of this). Overall I''m very pleased. This is the 6th Stauer addition to my collection.The instructions enclosed were a bit unclear, but after tinkering I was able to set it to the proper time zone for it to reflect local time.Since this, it is working fine with no discernable issues. My only complaint is the bracelet used for this watch. It is a bit too lightweight when compared to my Citizen''s Navyhawk watch for example. Otherwise, it is good value for the money. I was intrigued by the promo add for the watch in my Fur-Fish-Game mag. and suggested to my family that if they were stumped for a Xmas gift for me, I''d love to have one! Low and behold , it showed up under the tree !! My first impression was how elegant it looked. Secondly, the body was deeper than I had expected and I feared that it would be too bulky and heavy. I WAS WRONG . It is so unbelievably light that I hardly know it''s on my wrist. It looks great with dress clothes and casual. I love everything about it and would recommend it to anyone considering a high quality timepiece. Heck, Sheldon Cooper on &quot;The Big Bang Theory&quot; wears one ---- and he''s the ultimate hard to please perfectionist !!!! Now that''s an endorsement . Just received my titanium atomic watch. After a few minutes trying to get the time zone adjusted, it now works great & looks fantastic. I would have loved this watch if band quality was good. Very cheap band. Received this watch yesterday and played with its workings last night. It took me a while to figure out how to change time zone but I finaly did get it changed to Mountain Time. Watch case looks of good qualilty and durable. Hands and hour markers are luminating. Large easy to read face. If I keep it, I would upgrade the band to make it a quality watch. I also bought an outdoor Casio WVM120J-1 for $39. It is all digital but is solar & atomic with stopwatch, countdown timer, 5 alarms, water resistant to 330ft, syncs with multiple world atomic towers not just Denver. This watch has the classy look but the Casio has the functinality and durability. I''ve had mine for about a week now. I love the look and the light weight and it keeps perfect time but the minute hand is always about 30 seconds off from where it should be at 00 seconds. It''s a small thing and I can easily live with it but I expected the hands would be spot on with something that sets the time to the atomic clock. I received my new watch in a couple days after ordering it and was very happy with the watch. It is everything one would want in this type watch, accurate, stying, and ease of use. The only thing I can say I didn''t like was, there were no instructions on how to adjust the watch band. I had to call Stauer and was told I needed to take it to a jeweler and have this done. I received the tool to do this myself, but no instructions on how! Very recently I bought a Stauer atomic Watch and for the most part am very happy with it. I very much wish that they had coated the hands and number dots on the dial periphery with Tritium instead of the Radon that they apparently used. When exposed to a strong light source, like my 20 white LED pocket flashlight the radium will glow for perhaps as long as 20 minutes and then, in a fully dark room, the watch face becomes invisible. Since the half lite of Tritium is over 12 years and it glows brightly the whole time, it seems that on a high quality watch that is said to have a long life it would be the logical choice for nighttime illumination. Other than that when I asked about entering or leaving Daylight Saving Time they replied that it would be necessary to change the overall time zone, entailing a complete resetting of the watch. They would not say, though, which choice of time zones would be required. Fortunately, other reviewers have mentioned that it might take several days but that the change would be directed by the Fort Collins clock. I very much hope that they will shed a bit more light on this matter. Aside from that issue, I love the watch, and checks with the bureau of standards have confirm it''s accuracy. After careful thought, I finally ordered this watch. The only regret I have, is that I had not acted when I first saw it. I Am still leery of buying online, but have no complaints here. Nothing but good help.Thank you! Great watch - stylish, light weight, accurate.Could use better manual and instructions on how to change battery. I have had this fine watch for more than 3 years. It keeps itself synched with Boulder, therefore always exactly correct time. I have several watches and this one is light and tough, oh, and looks good too. Simple but elegant, face makes me proud to wear it. I''d give it 6 stars if that was an option. Awesome watch, keeps impeccable time and is very durable. Highly recommended. This watch is excellent. It is very light and extremely acurat. Cheep in comparison to other watches. Great looking and very light timepeice.Setting the time requires some patience but instructions are good and I like how it runs, very sharp. Only drawback may be the strap, as it is, well, very light and almost flimsey, the locking mechanism does not feel secure and has popped open several times already. I will give it a few weeks to see how it performs. The new atomic watch has an expandable strap, that looks cool and retro, will it fit??? I was ready to buy this outstanding watch but when I looked closer I found the watch didn''t have a sweeping second hand. I phoned Stauer to confirm if this was so and it was so. I did''t buy the watch for that reason, and for that reason only. This watch is by far one of, if not the best atomic watches made and were it to have a second hand on it I would have bought four of them for each of my grandchildren as gifts and they would probably be wearing the watch for the rest of their lives. I am so disappointed this watch didn''t have a sweeping second hand as it looks great and will stand the test of time. Perhaps Stauer will come out with this watch at a later date and have it with a sweeping second hand and I will buy four of them and everybody will be happy. Thank you Stauer for your outstanding products, especially your watches. light weight and is very comfortable. This watch was a gift. The craftsmanship is beautiful. The only problem was adjusting the watch band to fit my wrist. The pins are difficult to remove, took me about an hour. Over all the watch is everything I''ve wanted in a watch. I have one of the remarkable atomic watches, and can advise other gentleman from Charleston that if he simply places his watch in a Westward window it will update time overnight. Actually, I too live in the South and mine updates on the day that the change is made. I purchased the original Titanium/Atomic watch in 2007 and the battery still works. Recently, a bad scratch in the glass surface made the front surface unsightly and when I spoke with Customer Service, I was informed of the watch''s &quot;Exchange&quot; program; and to make a long story short, I could get a brand new replacement watch for a low cost of $ 29.95 !! What a great deal ! !Stauer, you have a customer for life ! The Customer Service department have some great, friendly and helpful people. WAY TO GO STAUER !! I still do not know how my stauer atomic watch is powered. Is it through the Colorado atomic watch and if so I would like to know. I like my stauer atomic watch very much, but what bothers me is I am in the dark as to how it is powered, and no detailed explanation has been given to me yet. Anybody knows? I love the watch. Keeps perfect time. But I live in Arizona and we don't observe DST here. Every time the rest of the country moves forward or back an hour, my watch changes, too. Then I have to set it back or forward manually to keep it on MST. Anyone know how to disable it from automatically changing? Very nice watch Im happy with. A very nice feature that they fail to mention, is that the watch automatically adjusts for daylight savings time. However the band has broken twice due to the pins falling out. Love the watch, was easy to set up. Only problem was the wrist band was too tight, so called Stauer and they sent me additional links, at no expense. Now the watch is GREAT and I wear it all the time. The company personnel I have dealt with were all exceptional and helpful. I could not be happier with watch. Works exactly as it should. Perfect timekeeping. Included directions could be better, but website directions considerably better. Infinitely better than the 2 Casio atomic watches I bought previously. I own ten watches. Three of them are atomic watches. By far this is the best of all. Great looks in the pulpit or on the tractor. I do miss the second hand, but not much. Extremely light. Easy to set up. I live about 600 miles from Ft. Collins, Co. and the radio has no trouble receiving a signal. My other two have to be set in the window to receive. Great watch. Best ever. I've had the Stauer Titanium Atomic Watch for over a year now and live in a low-signal area, the mid-Atlantic coast area. The lock symbol on the seconds display may take as long as a day or two to display if I leave it in a zero-signal area like a shielded room for awhile, but the watch sets itself immediately when Daylight Savings Time changes, or I change the time zone according to the instructions, whether or not the lock signal is displayed. I have a computer with its side covers off about 60 cm from my watch as I write this and I have the lock symbol displayed and the time is perfect. One reviewer says that his computer interferes with the watch signal to the extent that the watch sets itself to the wrong time. The WWVB signal is a complex, robust PSK signal on a VLF 60 kHz carrier, meaning that his computer needs a good hard look, and ASAP. Such interference coming out of something that supposedly has FCC clearance to be sold for home use is hard to believe. I bought this watch about a year ago and have been impressed with it every day since. It is very light weight and comfortable to wear; the styling makes it a joy to look at; its durability is unsurpassed. I worried that perhaps the multi-colored band (gunmetal and silver) might scratch or show wear, but it doesn't. The glass is still scratch free, despite all the scrapes I've had with it. We just went onto Daylight Savings, and the watch automatically set itself to the correct time. I'm a recreational diver and can attest to its being water proof at less than 100 feet of depth. I also work in IT and prefer this device to any currently available smart watch. I've had my watch for two or three years now. I have never questioned it's accuracy. Last night, checked it against the Atomic clock at W.W.V, Colorado Springs and found that it was one second slow, however, I checked it again early the next morning and it was right on with W.W.V. Hi Gary: I have a titanium atomic watch and I have no issue near my computer. If you still have this issue purchase a new one and the problem is solved. All the best to you. I bought this watch about 7 years ago. Setting the time, date, etc. Can be tricky but with a little practice, easy! If your watch runs slow, adjust it per manual. PDF of manual can be downloaded from Stauer. I am thinking of buying a new one. Loved the watch initially, Then - - - - - found that it looses one to thirty minutes at night. May be due to wearing it but have done so all my life. Battery in watch is a CR2025 If ever the watch starts losing time or displays just 00 and hands won't move at all replace the battery, I changed mine myself I do have a cheap watch repair kit from e-bay which include a holder for the watch and a small hammer which you strike a sharp object such as a pocket knife to get it open, Don't try to open the back cover any other way. Their are instructions inside the back cover that are very simple to set the time, not like the instructions that came with watch. I gave it a 5 star rating now that I'm able to work on it myself. This watch is great! Just set it up and it's good to go. I check the accuracy every few weeks and it is always right on! The battery lasts quite a while even by checking every couple weeks! Oh, I forgot to mention, I've had it for over 8 years! I like it so much, I bought one of the newer ones about a year ago for when this one breaks but it hasn't happened. Love it! Your Atomic Titanium wrist watch is an amazing work of technology/art. I have had many unique watches over the years, titanium, tungsten, gold, stainless steel, digital, analog/digital, tuning fork, etc, but this is the best. I do have a suggestion however. One should set the time zone after noon at the watch's location, else the date will change at noon instead of midnight. The U.S. government has engineered the most ingenious, most accurate clock in the world: the F-1 U.S. Atomic Clock in Boulder, Colorado. Our extraordinary new Stauer Titanium Atomic Watch utilizes the transmissions directly from that remarkable cesium fission atomic clock to report the most precise time. This scientifically-advanced timepiece will gain or lose only one second over a 80 million-year period. It is that accurate! This perfectly-tuned technological invention with the super light strength of titanium is now available. Super Light Titanium has two big advantages over steel. One is corrosion resistance and the other is that titanium has the highest strength-to-weight ratio of any metal, which means that titanium is approximately 45% lighter than steel. You'll never have to set this watch. Just a few pushes of the buttons, and you're synchronized with the atomic clock in Colorado, and the hands of the watch move to the exact time position. The sleek black textured dial has luminous hands and markers, plus the timepiece is water resistant to 3 ATMs. This Titanium Atomic Watch exceeds the accuracy of any Swiss luxury automatic, so you can be more punctual and keep most of your money in your wallet, not on your wrist. Fits wrists 6 ½"-9".